1. 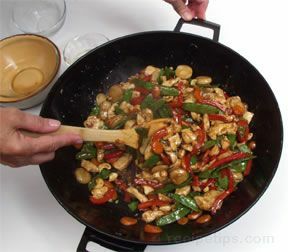 A basic Asian cooking method that generally uses a wok for the cooking, but also can be prepared in a frying pan. When stir-frying, small pieces of food are cooked in a small quantity of oil over high heat for a brief period of time, stirring constantly. Unlike stir-frying where the food is continuously turned, sautéing food involves the cooking of food by turning it only once in the pan in order to cook both sides. If the food, such as a thin cut of meat, is turned more than once, the cooking method is considered stir-frying or pan-frying rather than sautéing. Foods that are used for stir-frying usually consist of small pieces of chicken, fish, pork, or beef, diced or sliced vegetables, a small quantity of liquid to create a sauce, and various seasonings. 2. A name given to any dish prepared with the stir-fry method of cooking, such as a chicken stir-fry, pork stir-fry, vegetable stir-fry, or similar descriptive wording.